Looking for a game with specific criteria, let me know if you know something that fits the bill of all criteria. -Significant Hero advancement through a campaign (regarding attribute points/skills). Heroes need to keep levels from one adventure to the next. Not looking to just add an additional ability every once in a while. I know these are specific wants, if you know something that fits the bill please let me know. Sounds like you've got a real moon shot request there. Nearest I can think of is Descent w/ the iOS App, but even then the advancement is literally new skills. Kevin, I'm going to list a few games off the top of my head that *may* fit the bill, but you will have to spend your time to do the research and find out if they will. Although not "dungeon crawler" per se, it has the same feel. The "automated dungeon master" is the tough part to pull off well. Good luck, and let us know your findings! Your other option (and probably better option) is to play a video game. Lots of good ones out there, including free-to-play D&D Online. These are good but from my understanding, any advancement a character receives is reset upon the start of a new adventure. I don't know much about Talisman I will need to do some research there. In researching, Talisman is along the right lines, but doesn't really provide that campaign feel with an entire game lasting roughly 1.5 hours. 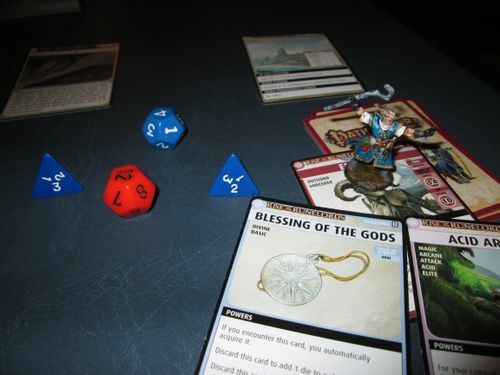 Pathfinder Adventure Card Game: Rise of the Runelords – Base Set your players level up. You gain new weapons, spells, and items through multiple adventures. Your characters also level up and get more powerful. I use a couple minis to show where the characters are, but besides that it is just dice and cards. Descent: Journeys in the Dark (Second Edition) with the Descent: Journeys in the Dark (Second Edition) – Road to Legend app should fit the bill. The app is free (on PC/Mac and iOS, not sure if Android is out yet...) and contains a mini campaign and one full length campaign. Thanks, this is one I have been contemplating. Obviously no minis but does provide a dungeon crawl like experience. The only thing is it takes some work to update the game. The game as released to retail is hard to understand. They printed up some updated material for KS backers called "2.0", and future retail releases of the game should come with the 2.0 version of the rulebook and cards, however, you can print out this stuff from the company's website, and use it with your 1.0 set like I did. You'll just have to print the new rulebook, sleeve your cards, and then print the new cards and slide them in front of the corresponding cards in the sleeve. It's a lot of work, but Myth is a fantastic game once it gets going. Edit: I see the 2.0 materials are also orderable through the company's website, so that makes things easier. I like what descent offers, but i haven't played it much. From my understanding there isn't much character advancement. If I'm not mistaken don't you just acquire new cards "abilities" occasionally? Myth is a game I've heard good things about. However there are so many offerings (original, 2.0, expansions etc.) I'm a bit confused where to begin. I know almost nothing about the game but I would be happy to do some research on it if you think it is a game i might like based on the criteria. Any suggestions where to begin? What would you say is needed for a solid game play experience? All you need to start is a base set and a 2.0 materials set, to update the confusing stuff from the game. There are two campaigns you can download from their website, "Fury of the Fireborne" and "Rise of the Revenant" on top of all the quests that come in the base game. Rise of the Revenant is particularly good. It's also good to note that with the 2nd kickstarter, they announced they'll be putting out proper boxed expansions that will allow you to upgrade your guys more, and there will be "modules" that each will have a quest chain plus new monsters, so these are a lot more appealing as a purchase than their previous expansions, which are just minis and a card to use them with. I should also say that Myth has slow character advancement, much like Descent 2. I happen to like Myth a lot more than Descent 2, but then I gave up on D2 before the co-op app was released, so that may be a different experience than the one I disliked. Shadows of Brimstone sounds like what you'd want, although I highly prefer Myth for it's gameplay. You just don't level up very fast with Myth. And it's expensive. Don't let the rules scare you, it's nowhere near as bad as people made it seem. Play, have fun, don't sweat the details and even the 1.0 rules were fine. Plus now there are some good videos to help as well as players willing to help all the time. Shadows of Brimstone would be perfect, and is a fantastic game, but it's not fantasy. So that stuff is REAL!? New abilities and items, primarily. What are you looking for instead? Stat increases or something? The item upgrades are going to be the primary way that sort of thing happens in Descent. I know I may have a contrary opinion here, but I definitely would NOT recommend Shadows of Brimstone. That game is just... I dunno. It's fun, but it's ultra clunky and the components are pretty bad. Again, it's fun, but just sooo clunky. Myth has arguably the same or less advancement as Descent. I think it's a fine game, but again I don't think it's what you're looking for. You can occasionally change a card in your deck (or get a title, which gives you a minor bonus). You get items throughout the adventure, but usually end up discarding them after each adventure RAW. PACG is okay. It probably has the type of development you're looking for... character advancement, stat increases, deck changes, etc., but the actual gameplay was VERY boring to me. Flip a card, roll a dice, repeat 1000 times. I realize that a lot of games could be reduced like that to the mechanics, but it's different when it just FEELS like that's what you're doing. Well, living on the east coast I don't really know how it is over there myself, but I trust the cowboy scientists that made the game not to lie to me. This was my experience with Pathfinder as well. It also doesn't use minis, which means it doesn't meet the criteria. I don't know as much as I would like about the character advancement in both Descent and Myth. If there is anyone knowledgeable who can simply clarify what types of advancements each game provides and if those advancements stick with your character, adventure after adventure I would greatly appreciate it. I also would highly recommend Shadows of Brimstone. Someone mentioned clunkiness. That goes away within a play or two, once you get the system down and decide on your preferred method of Experience point and money tracking. There is also a steady stream of new box sets coming out to keep the enemies fresh and different. and the addition of the Frontier Town expansion makes between adventures a lot of fun. My group doesn't usually like this sort of game, but this one is dripping with theme and we are having a lot of fun with it. I also agree with the assessment of Pathfinder. All it became was number crunching and the theme went out the window. In Descent 2, after a scenario, characters get money, they keep their new equipment, and they get one or two experience points. The experience points can be spent to unlock new ability cards in their chosen skill tree. The money can be spent at the merchant on better gear. All this sticks with the characters throughout the campaign. Myth is similar. In myth, at the end of a quest the characters get to keep some of their gear. Sometimes one of the rewards is getting a title, which gives you a permanent buf. Sometimes one of the rewards lets you swap a weaker card from your deck of action cards with a better card. Over the course of the game, you also improve your chances of finding better loot as you draw tokens out of the loot bag. All this stuff sticks with you through the campaign. To contrast these two games, in Shadows of Brimstone (which I know you aren't interested in) gives you actual character sheets. Characters level more similarly to an RPG, keeping loot, getting stat bumps, getting mutations which can have penalties or benefits, ect. It's a much more involved leveling system. To my knowledge, there is no fantasy themed game that does Shadows of Brimstone like leveling. I've played Descent 1, Descent 2, Talisman, Shadows of Brimstone, Myth, Level 7 Omega Protocol, Doom, Pathfinder Adventure Card Game, Mage Knight Board Game, Legends of Andor, Claustrophobia, Star Wars Imperial Assault, Dungeon Run, Super Dungeon Explore, Arcadia Quest, Assault on Doomrock, Catacombs 3rd ed, DungeonQuest 3 and Space Hulk 4. Kingdom Death: Monster is honestly the best (except for your characters dying a lot ), but it isn't really available. Kingdom Death: Monster is honestly the best (except for your characters dying a lot :laugh:), but it isn't really available. Myth is also a really good pick. The combat system is much more dynamic and involved that Descent. If you care about the quality of combat interactions, it's great at that. I personally love Myth but have a hard time recommending it because it had kind of a rough release. If you do research and determine its for you, you probably won't be disappointed. There are a few playthrough videos on the Myth forums that you can watch to see if you like the ideas. (I actually shot a three player game walkthrough/playthrough and never posted it. Maybe I'll do so now, problem is it's like three hours long :blush:).